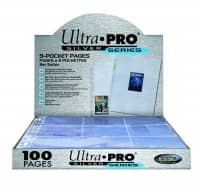 Factory Sealed 2018 Topps Update Series Baseball Hobby Box mit 36 Packs Per Box, 10 Cards Per Pack. 1 Autogramm oder Relic Card per Box ! Produktinformationen "2018 Topps Update Series Baseball Hobby Box MLB"
Featuring the player transactions and mid-season rookie call-ups, to season highlights and MLB All-Star Game content, the 2018 MLB season isn't complete without the release of Topps Baseball Update Series! 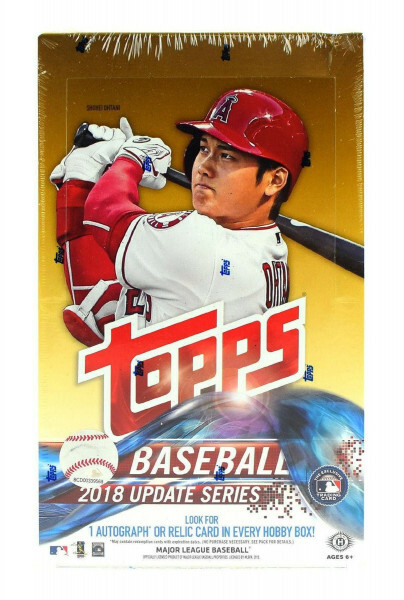 Exclusive silver packs for Hobby customers with 2018 Topps Baseball Update Series Purchase! Silver packs include MLB veterans, rookies and retired greats in the iconic 1983 Topps Baseball design on chrome technology! Numbered autographs and parallels included in select packs. Look for Rookie Cards of Juan Soto, Shohei Ohtani, Ronald Acuna, Jr., Gleyber Torres, Billy McKinney, Tyler O'Neill, Austin Meadows, Willy Adames, Freddy Peralta, Michael Soroka, Ryan Yarbrough, Dustin Fowler, Ronald Guzman, Lourdes Gurriel Jr., Franmil Reyes, Ronald Acuna Jr., Austin Gomber, Francisco Mejia, Joey Lucchesi, Isiah Kiner-Falefa, Yonny Chirinos and more! - Gold Parallel - Numbered to 2018. - Vintage Stock Parallel - Numbered to 99. - Mother's Day Hot Pink Parallel - Numbered to 50. - Father's Day Powder Blue Parallel - Numbered to 50. - Negative Parallel - Limited! - Memorial Day Parallel - Numbered to 25. - Blue Parallel - Limited. * Black Parallel - Numbered to 299. - Gold Parallel - Numbered to 50. - Red Parallel - Numbered to 10. - Autograph Parallel - Sequentially numbered to 10 or less. Highlighting the final year of legendary players' careers. - Black Parallel - Numbered to 299. - Red Parallel - Numbered to 10. * Platinum Parallel - Numbered 1/1. - Gold Parallel - Numbered to 99. - Blue Parallel - Numbered to 50. * Red Parallel - Numbered to 10. - Autograph Parallel - Sequentially numbered to 10. - Red Parallel - Numbered to 25 or less. - Black Parallel - Numbered to 99 or less. - Gold Parallel - Numbered to 50 or less. - Red Parallel - Numbered to 5. - Gold Parallel - Numbered to 10 or less. - Red Parallel - Numbered 1/1. - Blue Parallel - Numbered to 50. ALL-STAR STITCHES DUAL CARDS: Numbered to 25. ALL-STAR STITCHES TRIPLE CARDS: Numbered to 25. Weiterführende Links zu "2018 Topps Update Series Baseball Hobby Box MLB"
Fanbewertungen für "2018 Topps Update Series Baseball Hobby Box MLB"